Choosing Joy: 10 Ways to Help Someone Who is Grieving. 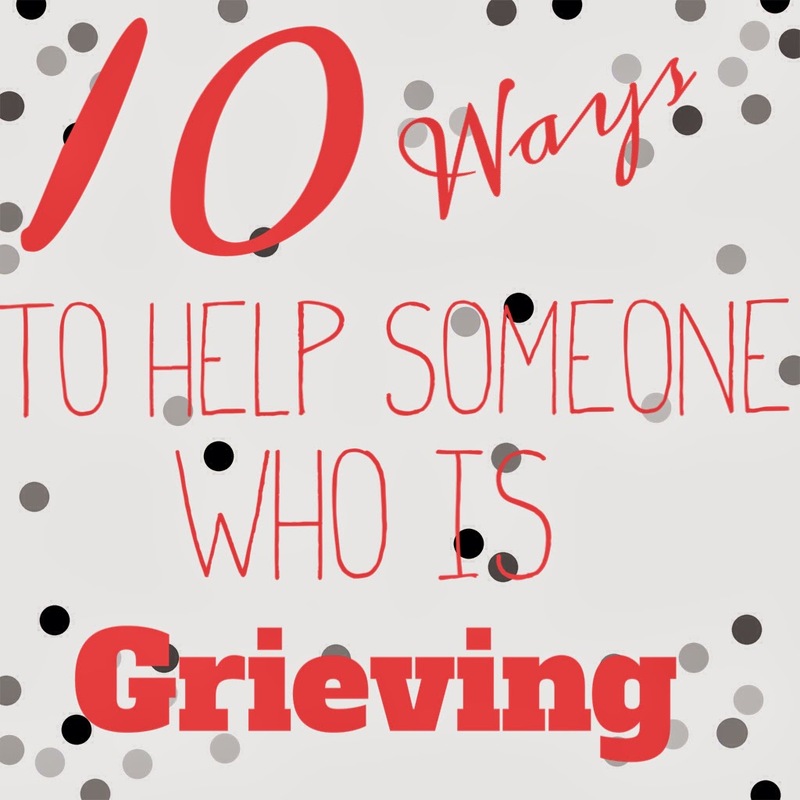 10 Ways to Help Someone Who is Grieving. We watched part two of the Rick Warren Series "How to Get Through What You're Going Through" last night. He talked about shock and one of the points he made was how to help people who are in shock. It made me realize that people don't typically know how to help someone who is going through extreme loss until they've been through it themselves. I thought I would share what was helpful to me and our family through this period of grief in our lives. 1. Do not say "Call me if you need anything". I never called one person who told me that. It puts the pressure on my end, and honestly I didn't have the time or energy to call someone and say "I need dinner tonight", it was easier to order pizza. 2. Do say "I'm bringing you dinner. Which night is better, Monday or Tuesday?" That takes pressure off and though it might seem pushy, it isn't. It made me not feel bad to say "Oh, Tuesday would be so great." 3. Go to the store. Bring essentials like toilet paper, paper towels, coffee (kcups), trash bags, paper plates and silverware. Maybe even get soda and frozen pizzas. Chances are that the grieving people are hosting more grieving people. This makes life easier. Don't ask them if they want you to do this, just do it. 4. If you have a good idea to share with the family, share it and then make it happen. A dear friend of ours gave us the idea to have Janet record books for the kids. In the last few weeks that Janet was home, we spent every waking hour over at their house. And while this was a great idea, at the time it wasn't highest on my priority list. Our friend made it happen. She went to the store, bought the books and dropped them off at the house without anyone asking. THAT was helpful and those books are priceless to me. 5. Be there. It was interesting to me to see which of our friends stepped in and which ones stepped out in this time. It is a hard time for a friend because you don't know what to do or say. I had someone in my life step in big time that before this was just an acquaintance. She brought several meals, brought a book for me about grief, helped us financially with a situation that wasn't necessary but it was a blessing. But the most precious thing she did for me was come over and sit and talk with me in the weeks before Janet died. She let me cry. She texted and called me to check on me, she hugged me when she saw me and she just covered me in love. More than anyone that wasn't family, this person made a huge difference to me. Looking back now, it kind of seems that her coming into my life was completely random but I know God placed her there for a reason and that wasn't to help anyone else in this process but to help ME. She singled me out, knew I was hurting and was there for me. If the Lord is calling you to be that person to someone, listen, it formed a very special friendship with someone I probably wouldn't have known more than an acquaintance otherwise. And to that person, you know who you are, YOU made a difference in my life, you were intentional with me. Thank you, that means more to me than you'll ever know. 6. Show up. This is similar to being there, but this is more about showing up and not having to do or say anything. It is the thought. We had several friends come to Janet's funeral for us. They didn't know Janet well or personally, but they showed up for us. I could cry right now just thinking about it. That is a picture of love that I didn't understand before this. Seeing their faces, hugging their necks and feeling so loved that our friends care enough about us to be there is one of the most priceless things there is. Several of them drove from out of town to be there. Speaking for Bryan and myself, thank you to our friends who did this. And to those of you reading and not knowing how to help someone who is grieving, sometimes you just need to show up. There are no words or actions, but just being there is the most important thing you can do. 7. Send a pizza. Send a giftcard. Send a care package. These were simple things but so helpful. The day we found out Janet's cancer was terminal (a very hard hard day for us) a very dear friend of mine texted me and told me that a pizza would be arriving at our house at 5 pm already paid for. Such a simple thing to do, but it spoke volumes. Now, obviously, I could have ordered my own pizza, but that isn't the point, when in shock and grief, not having to think about things like that are huge. We also had friends bring over gift cards for drive thru stuff, these are things that I am using still now. 8. Offer to babysit or help with the kids, and mean it. We are so lucky to be surrounded by family. My parents helped us tremendously with the boys while Janet was in the hospital and in hospice. They were amazing, but there were a few times they couldn't help and we were so grateful to have backup. I had to call our friend to come over early in the morning one day so Bryan and I could go to the hospice home and she came right over with bags packed to stay as long as we needed her. That was so helpful. 9. Call, Text, Email or Send a Card. Just to say you're thinking about them and praying for them. While I knew so many were praying, it was special to get those notes from people. 10. Pray. I know we wouldn't be doing as well as we are without being covered in prayer. We are so grateful for the prayers that have been sent our way and the Lord is hearing them. Chances are you either know someone who is grieving, you are grieving or you're about to be one of the two... I hope this gives you some examples of things you can do to help those who are in the hardest time of their lives. And to those who supported us, thank you, you made a difference! Your list is spot on!!! I haven't lost a parent like y'all have, but I did lose both of my grandparents last fall within 18 days of each other and just recently went through a period of sickness with my kids which resulted in our baby being hospitalized. It's such a blessing to get a text, gift card, meal, or something else tangible. The last few weeks have reminded me to return the favor next time someone I know is in that position. Hugs to you! I couldn't agree with you more. I lost my Mom in 2004...your brain just doesn't function well when going through something so hard. I would also add, after the calls, cards, phone calls, food stop, reality sets in...remember the living as well...and continue the cards, calls and texts. Another idea is to help with pets. When my dad had a massive stroke and we spent every waking moment and a few nights at the hospital, it was such a blessing to know our dogs were taken care of. This is a great list and having been through the loss of my dad, I can say you are spot on with your list. This is 100% awesome. This helped me so much. I've been through grief (my dad died in a plane crash 5 months prior to my wedding) and stood beside many, as they grieve. And this is 100% accurate and so helpful. Especially the part of "call me if you need anything" I NEVER EVER EVER EVER say it......it is natural to want to say this, everyone says this.....but JUST DO things. You are so great at how you expressed each of these points. Thank you for allowing us to learn from you as you walk though this. It's so helpful. And as a nurse (I know you are, too) this carries over into our field. I'm a disaster response nurse, and spent a month in the Philippines recently, and all of this is true even in situations like that. How to help hurting people. This should be published, it's a great post and as someone else said, such truth! We all know that folks that say, "call if you need anything" really mean it,but we also know that we are very unlikely to do that. Happy Valentine's Day my dear! My friend Amanda posted your blog and I couldn't help but take a peak! This list is amazing and when I went through my loss, it was the small stuff that mattered, that truly made a difference. I know a lady that writes beautifully and has made a very positive thing out of her loss, if you want to read her it's hope smiling brightly and it's pretty cool. You're a great writer! What a great list. I especially love number 10. I couldn't agree more on this list. It is just better to just show up, step in and do things for the grieving family instead of waiting for them to ask for your help. Of course there are those that really would prefer to be left alone for some time. When I lost my grandmother the day before New Year several years ago, there was nobody there at the funeral but us. We understood because it's New Year's day and people would prefer to stay with their families. But it was heart breaking to hear people celebrating everywhere and we were all so silent and weeping in our own corners at the funeral. My mum just had a massive stroke at the weekend, and it was not looking very hopeful. (Today she is much brighter though!) - how friends have already rallied round with love, prayers and practical help as been such an encouragement, and I know I can count on them whatever happens with Mum. It is so true about it being interesting who steps up when you're grieving. My dad passed away a week and a half ago and the people I thought would be there haven't necessarily and people I wouldn't have thought of have. The prayers for us, which my dad actually asked for in a letter he requested be read at his funeral, have to be what's holding us together. This is a great list. It is also great just for being a better person/friend. We went through a lot of radical issues last year and spent half the year in hospitals. Friends and family were amazing . Everybody wants to do something and offers help, but the people that just do something (and not just offer) are truly amazing and make a difference. I am now always trying to do something for others without asking and your list is very helpful. I agree with everything 100%. This is a fantastic list! I think people have such a hard time helping those grieving because they honestly dont know what to say or do so they feel its better to do nothing than do the wrong thing. Posts like this one help educate and give people praftical options to help friends ans loves ones going through a difficult time. It is also applicable to helping after a major surgery or illness.